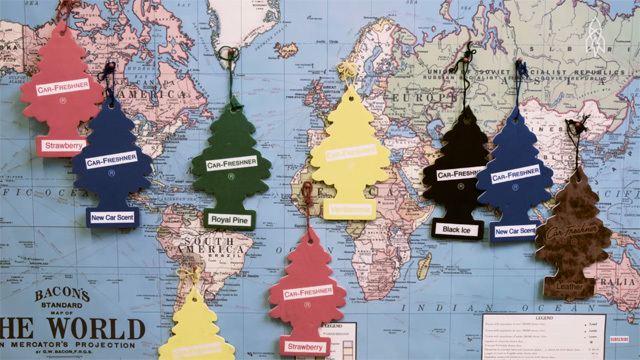 The iconic automotive air freshener Little Trees, that is shaped like a pine-tree, and that we so often see hanging from a rearview-mirror, is the result of a milkman's longing to get rid of odor of spilled milk inside his car, and Swiss-born chemist Julius Sämann's genius solution. Little Trees air fresheners the world over, owe their rearview-mirror-dangling existence to a chance encounter some 60 years ago in Watertown, N.Y. On that particular day, Julius Samann listened to a milkman complain about one of his occupational hazards, the stench of spoiled milk. It turned out he was talking to just the right guy. Samann, a German-Jewish chemist who fled the Nazis, had studied Alpine tree aromas in the forests of Canada. He was interested in the technology used to transport and disseminate them. In 1954, Samann filed a patent for paper impregnated with "odor-destroying, air-perfuming substances," a cellophane wrapper and a string to hang it on. The string was a necessity, he noted in his application, because "the substances are sometimes of an oily or sticky nature or hard to remove from the hands." The accompanying drawing featured a container holding a paper cutout of the profile of a bosomy, arch-backed pinup. But Samann eventually swapped out the pinup for the pine tree.